In a breakthrough for media planners, a Thinkbox study unlocks the secrets of TV viewing. Alasdair Reid reports. Thinkbox’s latest piece of research, Screen Life: TV In Demand, not only hints at the possibility of a new framework for planning in the audiovisual sector but also provides answers – and compelling ones at that – to what is, for some in the media industry, the most perplexing question of the age. For years, commentators have been predicting that internet-delivered video-on-demand would kill off live TV. Yet, if viewing figures are to be believed, it doesn’t look like happening any time soon. This new research, which gets under the skin of real viewing activity in the real world, might explain why. Conducted by the research companies Flamingo and Tapestry, it involved the analysis of more than 100 hours of observational footage from 18 households from across the UK for two weeks. It also embraced a diary study of 662 adults, across 3,692 viewing occasions, providing 250,000 data points for analysis. It identified six reasons we watch TV: to unwind (deferring life’s chores or de-stressing from the pressures of the day); for comfort (sharing family time, togetherness and routine); to connect (fulfilling a need to feel part of wider society); to experience (watching a live event in a communal setting); to escape (a yearning to be taken on an enjoyable journey to another time and place); and, lastly, a desire to indulge guilty pleasures with personal favourites. 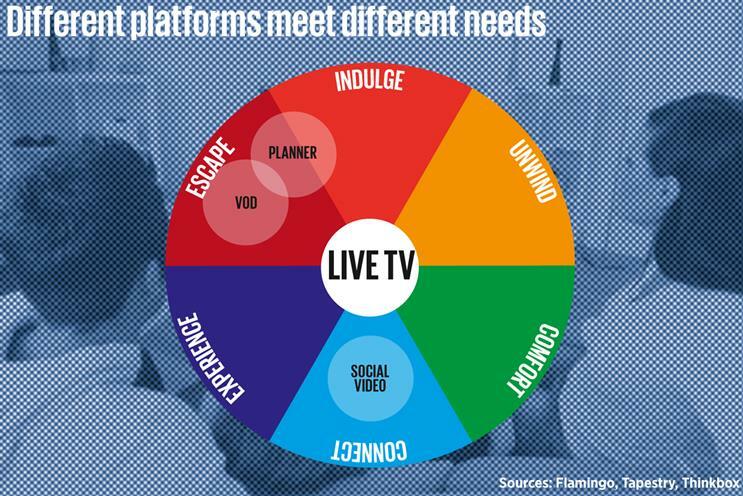 The study concludes that, while live TV can and does succeed in fulfilling all of those "need states" at least some of the time for at least some of the audience, VoD, by definition, skews towards two main strengths – escape and indulgence. In VoD mode, people are paying close attention to personally relevant material, usually on their own. And, of course, this analysis, while explaining big-picture viewing trends, could have some profound implications for media planning at a granular level too. Pauline Robson, the director of MediaCom’s research division, Real World Insight, says that the study confirms what a lot of people in media agencies had already been thinking. "It’s in line with findings from our own viewing research panel," she explains. "I think it’s important [to look beyond top-line data and] think about how people really behave in their homes." There will be those, however, who question whether much of this is actionable. The study points out that people in different need states are susceptible to different types of ad content. But advertisers can’t always afford to make different executions covering a spectrum of different scenarios on a range of different platforms. And the placement of copy on a highly segmented basis would add another layer of complexity to the media buying process. Again, that would have cost implications. But Simon Daglish, ITV’s group commercial director, says it’s a challenge that media agencies could do more to address. Daglish cites a recent supermarket digital campaign for pork pies that ran in health and fitness content. He links this sort of (potentially damaging) placement to a new belief that big data can be used to automate some forms of decision-making. "My real concern is that planners see all VoD as being the same," he states. "I hope [this new research] helps to change that. When we’re placing ads, we need to think not just about the data but about our knowledge [of the context] too."